With that team set to embark on a trip to New York to represent the country, we look back on that amazing season with Sportsman's review of the 1959/60 which we reproduce below by kind permission of the Burnley Express. This triumphant season of many memories has brought Burnley a measure of fame which has spread overseas. The winning of the championship of Division One of the Football League, after 39 years, crowned the selection of Burnley to represent England in the first international inter-club tournament in New York. Also it must not be forgotten that Turf Moor, represented by some of the younger players, won the Lancashire Senior Cup and various members of the senior team have been honoured by selection for representative matches. The championship will be remembered as much for the circumstances attending its winning as for the actual achievement. The team kept their supporters in a state of concentrated worry and intense excitement until the last minute of the League programme. Requiring two points in what proved to be the final match to be played - and that on the Monday after every other club except their opponents Manchester City had completed their list, the game had to be postponed from the original date March 12th owing to Burnley being engaged in an FA Cup tie - they had what was believed to be their largest away following of the season. Over 65,000 packed the Maine Road ground and thousands were unable to gain admittance, many approaching by road being turned back by the police. Burnley won 2-1 with the last goal to be scored in the last match of the League season as far as the division was concerned, and the team returned home to a tremendous reception from supporters who awaited their arrival and surrounded the coach outside the Town Hall. By their win, Burnley wrested the championship from Wolverhampton Wanderers, this depriving the Midlanders of a hat-trick of success and spoiling their chance of a League and Cup double. By coincidence Mr Harry Potts, the manager, was on the staff of Wolverhampton as a coach prior to taking the managership of Shrewsbury Town from whence he moved to take over at Turf Moor. The team's triumph is also that of the young manager who 13 years ago was a member of the side which reached Wembley and gained promotion to Division One. Mr Potts has worked with tremendous drive and enthusiasm to prepare the team and maintain it at a high pitch of fitness to resist all challenges and bring an honour to Turf Moor. Mr R. W. Lord, the club chairman, admitted on Monday night after the title had been clinched, that in his own mind he had felt that it would be about 1962 before the championship was won - and by that he was not being disrespectful to the present side which has a blend of youth and experience eminently fitted for the tasks faced with such success. Mr Potts has proved that he not only understands his side individually and collectively but can provide shrewd touches of reasoning which might baffle supporters at the time but are proved in the long run to be the best for the club. For instance there was the perseverance with Tommy Cummings - who had played for the senior team in 1948 and by his own persistence and the quiet encouragement of Mr Potts came back into football when all thought his career had ended. Cummings was given the centre-half role for the last few matches and played an important part in the triumph. The injury to John Connelly during the Easter period meant the promotion of Trevor Meredith for the vital last half-dozen games. Again the manager's shrewd judgement brought results, for Meredith, one of the smallest players on the books, scored three goals including the winner at Maine Road. Another successful move was the bringing in of Alex Elder, the young full-back who in an emergency was included in the side on September 15th, played an impressive match and retained his place for the remainder of the season in which he gained honours with Northern Ireland 'B' team, then a full international cap against Wales - and now a championship medal. Elder was 19 years of age during the season and to me is the club's young footballer of the year. An event which caused a shock was the application made by Bob Seith to be placed on the transfer list in April after holding the right-half position for so long. However the subsequent reorganisation in the half-back line, which reverted to the Adamson, Cummings, Miller formation, achieved results. Although Burnley were among the top half-dozen clubs in the League table for most of the campaign, strangely enough they did not occupy top place until after the last match, despite the fact that the leadership changed on several occasions. The team reached a period of exceptional brilliance between October 24th and December 12th, losing only one match (0-1 at Fulham), drawing at Hillsborough against Sheffield Wednesday and at Luton, and defeating Manchester City (h), Wolverhampton Wanderers (h), Nottingham Forest (h), Bolton Wanderers (h) and Arsenal (a). Best win was 8-0 against the Forest on November 21st when Jimmy Robson created a post-war club record in a League match by scoring five goals. During this spell they scored 26 goals against nine, surprisingly lost their next home match against Leeds United (0-1); beat Manchester United at Old Trafford 2-1 and finished 1959 with another home defeat in the return match 1-4 which was the heaviest reverse of the season at Turf Moor. However, the unpredictable Burnley side promptly responded with a remarkable 5-2 away win at West Ham who had beaten them 1-3 earlier in the season. Ian Lawson, substituting for Jimmy McIlroy, had a particularly impressive game. In the second half of the season Burnley won 11 matches, drew four and lost only three, the heaviest defeat of the campaign being sustained against their championship rivals Wolverhampton Wanderers who won at Molineux by 6-1. As the season drew to its close, the excitement became intense and there was particular tension and concentrated interest in the visit to Birmingham (a game postponed from February 13th because of snow). Burnley won this fixture 1-0 and so the way lay open for the title. However, a home goalless draw against Fulham, with both Wolverhampton Wanderers and Tottenham Hotspur winning against Chelsea and Blackpool respectively, made it imperative that Burnley should gain both points at Maine Road. The subsequent victory gave them the championship - with memorable scenes on the return home. The FA Cup provided a troublesome path to the quarter-finals with the team struggling throughout. They drew at Lincoln, won the replay; drew at Swansea, won the return; drew at Bradford against the City, won at Turf Moor, and then met Blackburn Rovers. Leading 3-0 with only 15 minutes to play, they again developed one of those inconsistencies of form and the Rovers forced a draw - and won the replay at Ewood Park. However, the old saying, used more as a consolation that 'They can now concentrate on the League' proved the truth in this instance, with happy results. Three players took part in every match - skipper Jimmy Adamson, Brian Miller and Ray Pointer. Adam Blacklaw, John Angus and Brian Pilkington each missed one League game, and Jimmy Robson missed four. A feature of the scoring list was that John Connelly, the outside-right, netted 20, Ray Pointer 19 and Jimmy Robson 18. No mention of the forward play can be complete without reference to the part of Jimmy McIlroy, the 'general' who battled against injury in the latter part of the season. He damaged a muscle at Highbury on December 12th on the eve of the cup-tie series and there was no doubt that he was handicapped on the heavy grounds. Then after making a complete recovery, he was injured in the vital game at Birmingham, missed the Fulham fixture and took part in the hectic final struggle at Maine Road with his right thigh strapped up. The season commenced in unlucky fashion as far as injuries were concerned. Colin McDonald was still recovering from the bad break his leg suffered the previous March and then, in training, David Smith received a fracture and in the first home reserve game, Trevor Meredith had his leg broken. Then, after he had resumed playing, the fullback [Smith] sustained a further leg injury and at the end of the season was on crutches - but as cheerful as ever. John Connelly, who during the season had gained a place in the England side at outside-right, had the misfortune to suffer from cartilage trouble a few weeks before the close, had an operation and of course, was forced to retire from the England tour of the Continent. Adam Blacklaw was selected twice for Scotland 'B' and John Angus, Brian Miller and Ray Pointer for the Wembley eve annual game in London. McIlroy was an Ireland ever-present. The Burnley team which defeated Manchester United 4-2 in the final of the Lancashire Senior Cup at Turf Moor on April 12th was: Furnell, Smith, Marshall, Joyce, Talbut, Scott, Meredith, Lawson, Lochhead, Fenton, Harris (Joyce, Lochhead(2) and Harris were the home scorers). 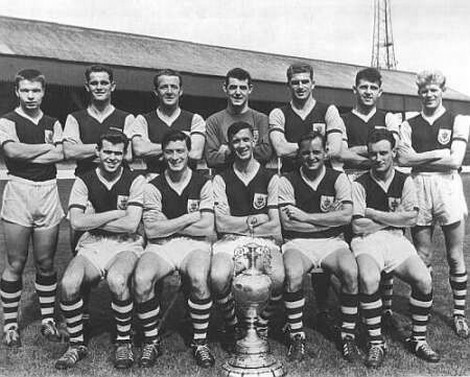 Both manager Mr Harry Potts and trainer George Bray were members of the Burnley team which won the trophy in 1950. Another still at Turf Moor was Tommy Cummings who was centre-half.